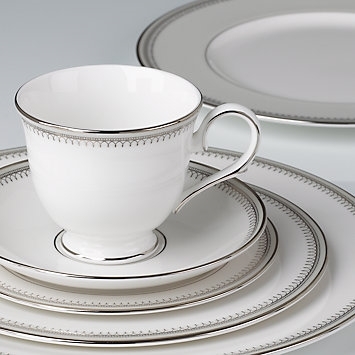 Trimmed in shimmering platinum, the Belle Haven 5-piece Place Setting has all the elegance of white bone china with just a bit of whimsy. Delicate beading and soft pewter bands adds a bit of flourish to create an enchanting ambiance. Diameter: Dinner plate 10 3/4", Salad Plate 8", Butter Plate 6", Saucer 5 3/4"